This is “Chuck Box V.2” for me. 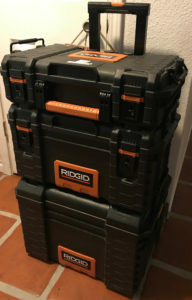 My current upgrade, from previous Stanley “Fat Max” tool boxes that I used for several years. My latest upgraded version uses these Rigid Brand Stackable and Wheeled tool totes, shown in this article.. Ever since covered wagons, I would imagine the Chuck Box has been a common term. Before that, I am sure migrating people had a simpler and smaller means of transporting some of their precious spice items. Those items that were not easily obtained foraging natures surrounding supplies. If you have camped many years you have probably changed out your own method of carrying your own staples. Having your items with you, rather than being dependent on an inconvenient source to purchase (forage) your own items while camping. I say this is version 2 for me, but that is version 2 in a recent sense. In reality I have tried numerous configurations over a lifetime of camping. All common containers many people use, such as Tupperware or plastic shoe boxes. My current method is “Rigid” totes. I hope people viewing the blog take the time to forward us photos of your own “tried and true” method. We want to add them to this article. So tell us a little about yours and about yourself. Or what you think of ours? Ours does not have the “coolness ” factor of a handcrafted wood Chuck Box, but they are highly functional. The boxes have been along on multi-day trips, Dutch Oven Cooking events, and regular campground camping. We have ours loaded so we are not wanting of anything. We use 3 Stack-able and Wheeled totes made by Rigid. Finding ours at Home Depot for about $130. They seal well against rain, have latches to slow down critters, carrying handles, and side handles that also serve to latch all 3 together as one unit. The totes are often left on the picnic table at all times (unless in bear country) and they have never had the critters get in them. They also sit out, getting rained on at times. When we return home from camping, the used items are replenished. 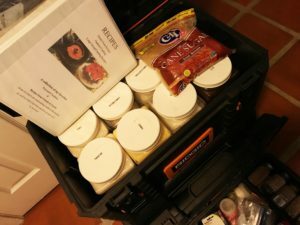 Everything is kept inside the house so the ingredients are always fresh and ready to go for the next trip. Dry Ingredients such as flour, pancake mix, etc is rotated when we replenish. We dump the unused portion out on foil. Refill the used portion from new supply in the house, then dump the older ingredient now on the foil, back in on top to fill our camp container. 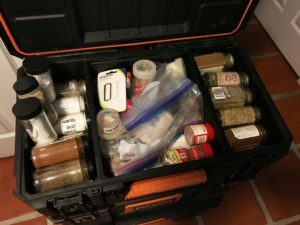 The top box is all spices and several small containers of Crisco. This box is equipped as well as my home kitchen. The middle box is the dry ingredient box. Larger containers of things like Flour, Sugar, and Coffee. In in their own larger screw lid containers. There is also extra room for cookbooks and bags of backup items. A couple containers do double duty. The largest box, on the bottom is also wheeled and has a telescoping handle to assist in wheeling all three boxes as a single unit. 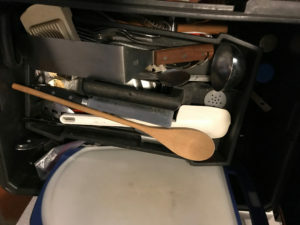 This bottom box is my catch all for small cutting boards, utensils, knives, and silverware. Here is a list of items in my three boxes. 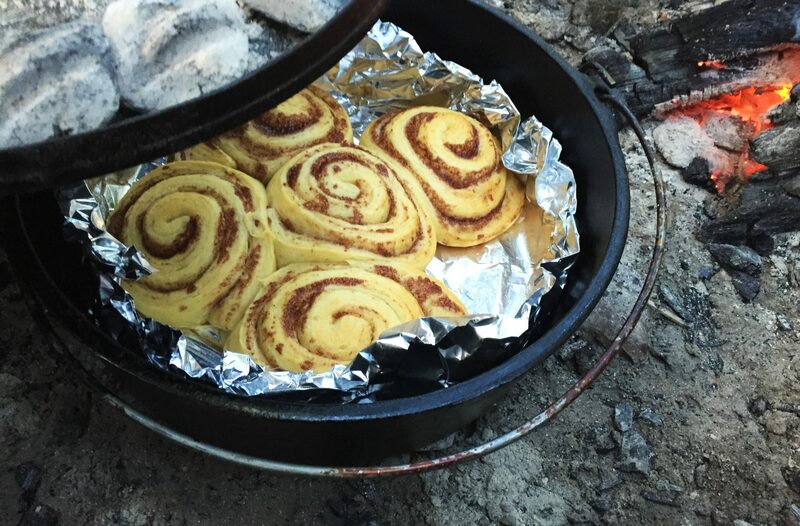 I cook with large groups and can cook or bake anything with what I carry. Adjust your items to suit your needs.